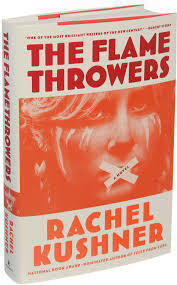 I picked up The Flamethrowers because it was one of the most talked about books of 2013, because it was nominated for a National Book Award, and because my friend happened to own it and leant it to me. While reading it, I quickly realized that this book was going to be more important to me than just another one to cross off my list of books I should read. This revelation hit me before opening the book, when I attended a reading and Q&A with author Rachel Kushner. She is petite, mousy, secretly a badass (she is an avid motorcycle lover, a characteristic that carries over to the protagonist of her book), spent many years in the New York art scene (this also makes its way into the book), and is highly intellectual. By the end of the event, I confessed to my friend that I didn’t feel smart enough for what I had just witnessed. She said the same thing, explaining that she likes to read books that are just a bit over her head so she feels like she is learning something. The Flamethrowers combines the 1970s art world of Greenwich Village with the legacy of a wealthy Italian family that runs from WWI up to the political and social unrest happening in Italy in the ’60s and ’70s. The story is told in the present primarily through a protagonist nicknamed Reno. She comes from Nevada, small town poverty, and riding motorcycles–a young, waifish recent art school graduate who moves to New York and is swooped up into the chaotic art scene by her Italian lover Sandro, the heir to the family whose lives are chronicled in alternating chapters from Reno’s story. Her relationship with Sandro and Sandro’s best friend Ronnie makes up the central plot of the story, intertwined with Italy’s upheaval, something Reno becomes involved with when she and Sandro visit Italy in the latter half of the book. Kushner really nails the struggle of the artist. Near the book’s end, after the reader feels empathy for Reno and hates Sandro for what he does to her, Kushner surprised me by telling part of the story through Sandro’s eyes, thereby asking me to feel sympathy for him as well; not to forgive him, but to understand him better. In a flashback to his childhood, we see Sandro interact with his father, the head of a million-dollar company, who takes Sandro to one of his factories to show him the life he will never have. When Sandro asks his father why he did this, his father replies, “Because you are going to be an artist… And it was important to establish that you aren’t suited to anything else. That’s what artists are… those who are useless for anything else.” This sounds harsh, but I took comfort in it. The Flamethrowers is a book about those people who aren’t suited for anything else. It’s better to figure that out early as an artist so you don’t waste your time attempting to fit yourself into a mold.